Lately I’ve been listening to a lot of pundits talk about the sudden resurgence of Liverpool Football Club as a contender amongst the elite of English football. There are many theories for our current windfall. Changing the defensive formation is generally the most popular thought, while the inclusion of Emre Can into the lineup is another widely-held belief. One particular “expert” recently intimated that this turnaround can be directly attributed to Steven Gerrard’s announcement that he won’t return to the club next season. The resulting commentary that ensued was quite remarkable to me, showing an extreme bipolarity of opinions from the Liverpool faithful. Some call it blasphemous to think the club was being held back by the legend, while others insist that his play has deteriorated to the point that he doesn’t deserve a starting spot in our best eleven any longer. I’m not really sure where I stand on this issue, but it gets me thinking every time the camera flashes over to him sitting in the stands of a match. While it’s true the club has conceded more goals than scored when he’s on the pitch this season, I still struggle with the thought that Captain Fantastic is hurting this club. I was listening to a podcast last week when someone lamented how they shared a train with Blackburn Rover supporters after the 0-0 draw in the FA Cup quarterfinal. 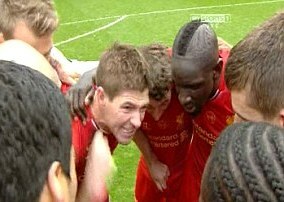 As they celebrated that result, the supporters started singing the now infamous “Steven Gerrard slip” song. Really??? A mid-table team in the Championship taking pleasure in the misfortunes of the Liverpool captain. If you listen closely, you can hear the song at every away Liverpool match. Even as he sits in the stands watching “kids” 14 years his junior battle on the pitch, Gerrard is constantly getting roasted by opposing fans. When you consider the roller-coaster that his mind has been on for the last year, you can’t help but think about the gravity that is being Steven Gerrard. I want to take a moment and review the past year in the world of Steven Gerrard. Let’s flash back to this same weekend a year ago. Liverpool had only the league to contend with, sitting tied for third place with Arsenal while on a 4-game winning streak. 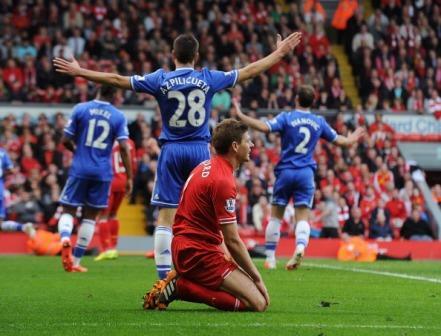 The Reds were seven points shy of leaders Chelsea as they went to Old Trafford to play the Red Devils. We all expected Liverpool to dominate the downtrodden United, and that’s precisely what they did. Two Gerrard penalties highlighted the 3-0 win, and only the left post prevented a rare penalty kick hat trick for our talismanic captain. Life was good. 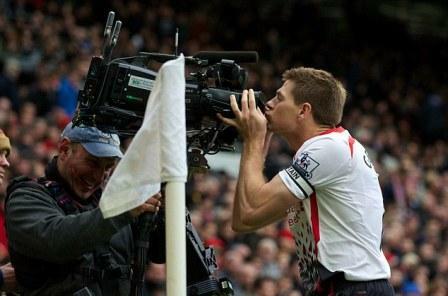 Images of Gerrard kissing the camera are etched in my memory for eternity. The fans started believing that Champions League was in our future. The fans started singing to the rest of the country that “now you’re gonna believe us, we’re gonna win the league!” The players started believing as well. Four weeks later came the next important weekend in the schedule. On April 12th Liverpool sat atop the league standings tied with Chelsea, but Manchester City were in prime position to take the top spot with two games in hand as they traveled to Anfield for a critical grudge match. Emotions were high, not only for the importance of the fixture but for the fact that the entire community would be honoring the 25-year anniversary of the Hillsborough tragedy later that week. Hillsborough week is always an emotional time for the Gerrard family, as his cousin Jon-Paul Gilhooley was the youngest of the 96 supporters killed on that tragic afternoon. 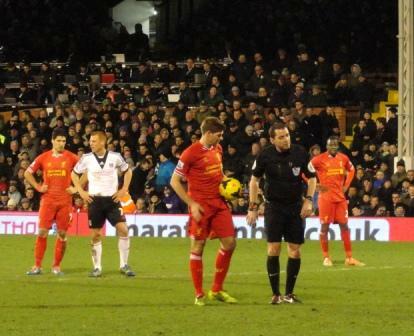 Gerrard assisted a 26th minute Martin Skrtel goal with a fine cross as the Reds took a 2-0 lead at the half. City quickly equalized in the second half and a crushing draw loomed until a Vincent Kompany error aided the late winner from Phillippe Coutinho. Elation ensued. The victory finally put Liverpool in control of their title destiny. Win only four matches left to be played, Liverpool could win their first title in the Premiership era. You could see the collective sigh of relief once the final whistle blew. Television cameras surrounded the club as Gerrard told his teammates “we go again next week at Norwich and do the same thing!” It was a war cry, a phrase adopted by millions of Liverpool supporters globally. Gerrard had effectively told the entire Liverpool fan base to jump on his shoulders and let him lead us to the title. Everyone started to believe. We dared to dream. Following an impressive but hard-fought 3-2 victory at Norwich, it was time to host Chelsea on April 27. This was the final hurdle Liverpool needed to clear before getting one hand on that title. Optimism was at a level not seen on Merseyside since the late 80’s. As Mourinho’s boys parked the bus hoping to get out of Anfield with a 0-0 draw, Liverpool dominated possession. And then it happened: the Slip. I couldn’t imagine the agony that possessed Gerrard as he watched Demba Ba break in on goal uncontested and slot the winner past Mignolet. Unable to equalize in the second half, Liverpool let their most realistic chance to win the Premiership heartbreakingly disappear. It wasn’t solely his fault, but you know that Gerrard accepted lone responsibility for the loss. That’s what leaders do. It doesn’t matter how loud and proud the Kop would sing to him, nothing could erase that moment in time. It had to be devastating. When I was nine years old, I would fantasize about scoring the goal that wins the World Cup. You don’t visualize making the mistake that ultimately nullifies that dream. When Gerrard was nine, he joined the Liverpool Academy and probably dreamt of leading the Reds to a Premiership title. Finally when that dream was within his grasp, it literally slipped away. No one could fathom the emotional weight that he’s been carrying ever since. In his mind he let the city down. Summer arrives and most teammates started to size up their vacation plans. Gerrard’s plans had to wait as he captained England into the World Cup in Brazil. If you think it’s emotionally tough to try and lead your beloved club to their first league title in 24 years, try leading your country to their first World Cup title in 48 years. We’ve all heard the criticisms from non-Liverpool English fans before. Gerrard has never done for his country what he’s done for his club. It’s funny how I don’t hear the same criticisms of David Beckham, Wayne Rooney or Frank Lampard, or any other English footballer in the past half-century. Yet it’s common for Englishmen to make that claim of Gerrard. Regardless he answered the call and traveled to Brazil with hopes of erasing recent failures by bringing World Cup glory home as England captain. England got a difficult draw in Brazil 2014, but not impossible. The opening 2-1 loss against Italy made the challenge immensely more difficult, and they needed a result against Uruguay in their second match for any chance to advance. Uruguay was disappointing following their 3-1 defeat to Costa Rica, so it was clear that both teams were desperate for a result. Fresh off a knee injury Liverpool teammate Luis Suarez made his World Cup debut for Uruguay, and the teams were tied 1-1 heading into the final minutes. The Uruguayan keeper booted the ball down two-thirds of the field, and 40 yards from his own goal Gerrard attempted to head the ball forward. 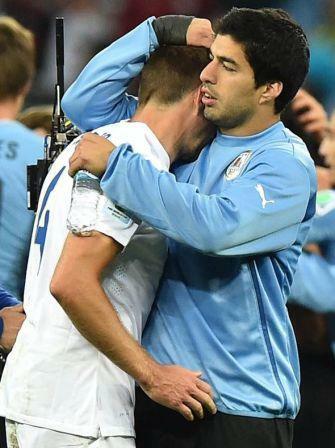 It skimmed off his head straight to Suarez who fired a rocket past Joe Hart for the winning goal in the 85th minute. Uruguay wins 2-1 and England is eliminated. Much like most Suarez goals it was an incredible feat of individual skill, but if that were my head the ball skimmed off that ultimately led to elimination in my final World Cup match it would live me for the rest of my life. I can only imagine it having the same effect on Steven Gerrard. He’s only human. Now it’s August, time to begin the next campaign for Liverpool. Suarez is gone and a new crop of talent is assembled. We all know that the season started abysmally poor for the Reds, with an early exit out of Champions League pouring salt into the wound. Every time Gerrard takes the pitch, opposing fans revel in singing about how he slipped on his you-know-what. It doesn’t matter who the Reds are playing, the songs continue to ring through the stadium. He hears them. They won’t let him forget the pain. He’s only human. It’s January 2nd and the season is halfway complete. He has a contract offer from Liverpool sitting in front of him. The club claims it’s more than fair, and it probably was. At the age of 34, he’s faced with the most difficult decision of his life. He has a lucrative offer to take his family to Los Angeles and continue to play the game he loves for a handsome paycheck. Or he can return to the only club he’s known for 25 years and continue to deal with the daily barrage of reminders of what could’ve been. If you were in shoes, what would you do? I can’t honestly answer, but I do know that he’s earned the right to make that decision for himself. He’s earned the right to take care of his family in the best way that he sees fit. Liverpool Football Club doesn’t owe him a thing, but in my opinion his teammates do. He may not fit into the starting lineup with the current run of form, and that’s fine. Those players that do belong on the pitch owe it to Gerrard to give 100% effort to get to the FA Cup final. They owe it to him to play their best football and finish as high up the league ladder as possible. 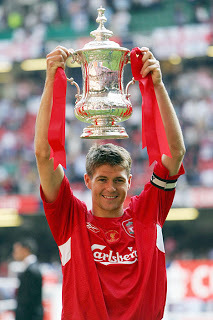 I know they will, and if it all works out then Gerrard will get to hoist one final Cup at Wembley on his 35th birthday. It won’t erase the ugly memories from the past year, but it will certainly help. Liverpool Football Club doesn’t owe him a thing, but they can certainly give him one hell of a going-away present on May 30. ← Should He Stay or Should He Go??? It is our ultimate legend .